Air is a mixture of moisture and air. Hence this moisture needed to be removed from the air by changing the temperature and humidity through a medium. The process in which the moisture is removed from the air is called Dehumidification process. This functionality could be achieved by using Appidi Dehumidifiers. midifier shall be Honeycomb Desiccant type and the patented refined technology which goes into manufacturing of Desiccant Rotors is most reliable and energy efficient. As a result our rotors will regenerate to its optimum level with only 120 Deg C.
In several cases our Dehumidifiers are working with only low pressure steam of 3.2 Kg / Cm2 without adding any backup heaters. Our Dehumidifiers are so efficient that they maintain as low as 12% Relative Humidity with only 85 Deg C regeneration temperatures in favorable weather seasons. The basic Dehumidifier model starts from 360 CFM. This basic model is used for achieving the desired conditions. Depending on the requirement the larger models would be recommended for achieving the desired conditions. The basic model can consist of pre filter, Desiccant Rotor and Process fan in the supply section and heat retardant filter, heaters/ steam coil and Reactivation fan on the re generation section. Engineered Dehumidifiers will be available in various combinations like Dehumidifier with complete AHU, Pre cooling coil and after cooling coil sections and required filtration, process fan of desired static pressure. By pass arrangement for the return air, desiccant rotor etc. Our Desiccant rotors are integrated with silica gel metal silicates by special manufacturing process which has a capability of high moisture removal. The Dehumidifiers range starts from 360 CFM and extend up to 25,000 CFM in single unit. 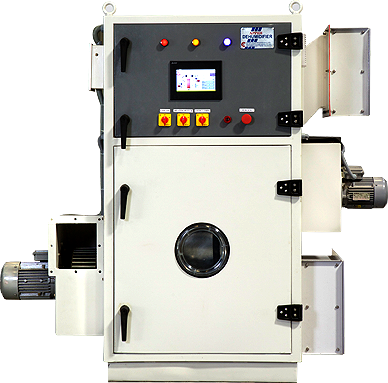 Many applications require specially selected Dehumidifiers to achieve the desired conditions.